"How did you first hear about ambigrams?" One day in February 2009, I came across the word "ambigram" on the internet. I thought about the word and the origin of its parts: "ambi" for "both," like "ambidextrous" for "both-handed," and "gram" for "written," like "telegram" for "distant written" -- a message that is written and then sent across a distance to its recipient. So an "ambigram" must be "both-written" or "writing that uses both sides." Then I looked up the definition and found that it is a style of writing that can be viewed from more than one perspective so that you can see either the same or a different message. I like to tell people that whether I am standing on my toes or standing on my head, I am still "Rebecca May." 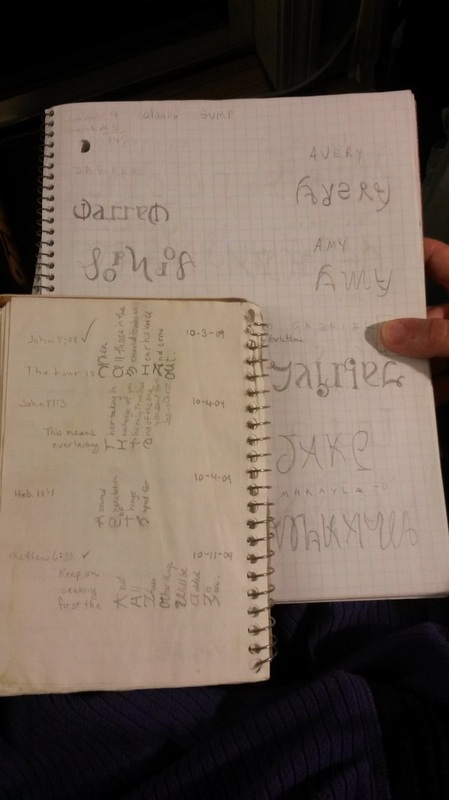 It was soon after encountering the word "ambigram" that I started experimenting with names -- Lots And Lots Of Names. For example, I modified the letter shapes of my own name, "Rebecca May," so that I could read it both right-side-up and up-side-down. I drew dozens of names of people I knew. Some names I rotated. Some I made as reflections -- either left to right as in a mirror or top to bottom as if on the surface of a still lake. I even got a few names to turn into another name when rotated. At this point, I was still using Microsoft Paint, which prevented my drawings from becoming "good quality" images, as Paint is pixel-based and I would have to make my images really large in order to get my curved lines to look anywhere near smooth. I soon learned of Inkscape, downloaded it, and did lots of experimenting with its vector graphics drawing tools, especially "Calligraphic Stroke," and "Edit Paths by Nodes." It was either before or during this time that I also acquired a tablet-with-stylus which made the act of drawing far easier than with a standard mouse or trackball. This was several years before portable tablet computers were developed, so when I mention my "tablet," I am referring to a USB plug-in device that resembles a mouse pad with a pen-shaped mouse. "Where does the 'Greetings' part come in? A few months after drawing names upon names upon names, I remembered that my parents' anniversary was fast approaching. And don't all parents love it when their children, no matter the age, make their own greeting cards?? Of course they do! Look at a lower-case cursive "h." Now take that "h" and rotate it 180 degrees. Doesn't it look very much like a lower-case cursive "y"? I started there, and adjusted the rest of the letter shapes in the phrase "happy anniversary" so that each letter or letter combination did two jobs: one up-side-down, and the other right-side-up, mixing capitals with lower case if the letter shapes demanded it. Because the two words were of different lengths, I could not leave the words broken -- while "happy anniversary" would look fine, "happyannive rsary" would look weird -- so I squished the two words together as though one word and waved the lettering into peaks and valleys. After sketching them out to my satisfaction on paper, I drew these shapes into the computer using Inkscape and my drawing tablet. I added some confetti shapes of different colors, and added a descriptive paragraph for the back of the card. I got a serendipitous surprise when I printed it -- the black ink was fine, no problems there, but the colored ink tanks or print heads were not working right, so all of the confetti was streaky-colored instead of solid-colored. I guess it came out looking more "festive" that way. When I had completed the card, I paused and thought, "How many MORE greeting card phrases can I draw this way?!" And that is when "ambigram fever" REALLY hit me. Within a few months I realized I needed a website and I also started signing up for artisan and craft events. "Do you use a computer program to 'make' these?" People often ask me if I use a computer program to "make" my ambigrams. I have to chuckle because they seem to be asking if the creation process is automated or somehow computer generated. My reply to them: "My Brain." All of my designs start by picturing in my mind how the letter shapes might "play nice" together. From there, I sketch it out on paper -- I prefer to use graph paper. After I have the shapes the way I want them to look, it is only then that I turn to the computer and draw the design all over again. I use Inkscape, a scalable vector graphics program. The smaller sketchbook is one of my originals from 2009. At the time, I was grouping my sketches into categories. Here is a look at a page from the "Scripture Art" section. Go Ahead and Dare Me. ﻿In these modern times in which we live, there seem to be only so many names to go around, and people have decided to start spelling the same old names in new and creative ways -- or even making up new ones. This makes it difficult for Kristene and Makayla and Houstin to find ready-made personalized items like key chains and coffee mugs. Enter the Ambigram Artist. I love it when a potential buyer -- especially one with a "uniquely spelled" name -- watches as I work on a quick sketch of their name right before their eyes -- and when their faces light up in amazement as they discover that the wonderful world of ambigrams has room for their name too. The most popular custom-ordered item at my artisan booth is personalized ambigram bookmarks. Some letter shapes and combinations can be difficult to work with, and I have to take on the challenge from a different approach. If my first attempt is a flop, I don't give up right then. I try a different arrangement, perhaps a mirrored reflection or an infinity chain. ﻿Do you think your name or greeting card phrase suggestion might be too difficult a task? You could earn a coupon toward your purchase if you Dare Me.